Anterior knee pain is often the result of patellofemoral problems. Patellofemoral malalignment can result from a acute injury such as a patellar dislocation or acute subluxation or it may develop gradually in patients who are predisposed. Anterior knee pain can also result from overuse of a "normal knee." Normally the patella (knee cap) glides smoothly into its grove (trochlea). It is very important to have excellent muscle strength and control to help guide the patella during activities. Tightness or lack of flexibility can cause the patella to track incorrectly through the trochlea or to overload tissues to the point of causing pain. When the patella tracks abnormally, stress is concentrated in the bone and surrounding soft tissues and pain often results. The majority of the time such malalignment can be successfully treated by an exercise program which includes stretching the tight structures and strengthening the muscles which have become relatively weak. When pure overuse is a major part of the problem, activity limitation is a necessary part of the treatment. When this fails to produce adequate improvement and patellofemoral malalignment can be documented by studies such as a CT scan, patellofemoral realignment surgery can often produce significant pain relief. In some patients with patellar instability without severe damage to the cartilage surface of the patella, an operation to balance the medial and lateral ligaments which guide patellar tracking can be very successful. This may include imbrication (tightening) or reconstruction (using a graft to rebuild) of the medial ligaments and at times release or lengthening of the lateral retinaculum. 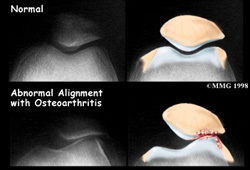 Patients who have more severe malalignment and particularly those who have had recurrent patellar dislocations with damage to the cartilage surface of the patella are better treated by a realignment procedure which includes tibial tubercle transfer. This means that the bony attachment of the patellar tendon to the tibia is moved to ensure that the patella tracks more correctly. 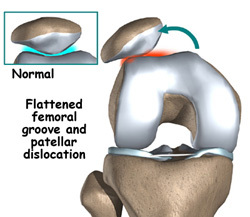 In cases where there is significant degenerative change of the patella, the tubercle is also shifted forward. This operation is combined with a lateral release to complete the realignment. The combination of these two procedures is referred to as anteromedialization of the tibialtubercle (AMZ).